Welcome to the first addition of my post-challenge week results segment that I have decided to dub “Triumph or Tacky?”! I know, the name is horrible but it beats my original less inspired idea of calling it the “Tuesday Testimonial”. This is a post that I will write every Tuesday to go over the results of the previous week’s challenge and let you know what the reactions were to my outfit from people who have seen it in person (I’m going to try to make a habit out of wearing the challenge outfits on Tuesdays). So how did I do in the Week 1 Marc Jacobs cardigan challenge? Given that it was my very first challenge for this experiment I think that I did pretty darn well and the online votes seem to agree with me so I think this week was a triumph! So far a total of 11 people have voted (first of all I’m amazed that you’re actually reading this!) and 9 out of the 11 people thought that I did great (to the two people who voted “Good effort but not quite close enough” I appreciate your honesty and thank you for keeping my budget in mind and not choosing the last option). Now what about the outfit in person? Well as Murphy’s Law would have it I picked the coldest freakin day of the week to wear a skirt since it felt like -28C this morning with the wind chill! 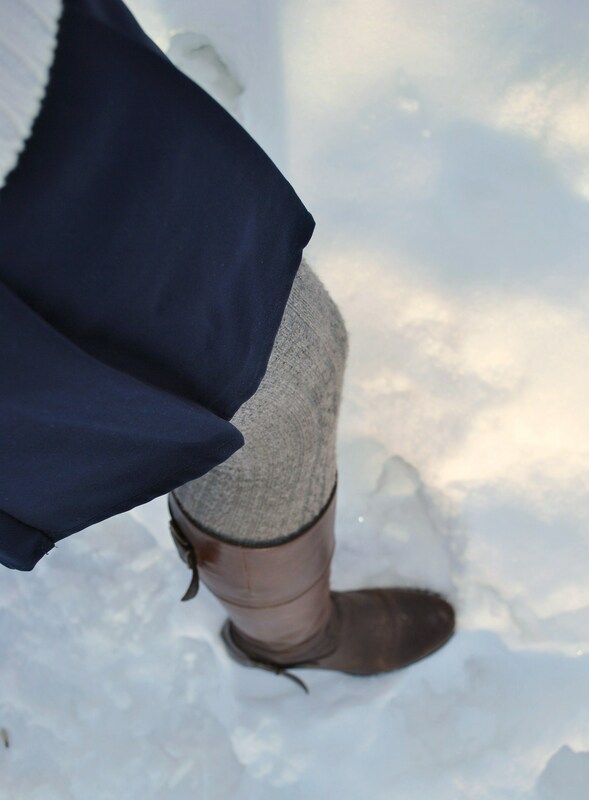 Since I have wholeheartedly committed myself to this challenge I couldn’t cop out and wear something else so I paired my outfit with an incredibly stylish pair of good old Canadian wool tights…. actually they’re wool long johns that are probably circa 1986 but fashion sometimes needs to be tweaked to accommodate the elements so consider them my tribute to practical Canadian attire. I may have lost points for styling, seriously though, it was cold! Unfortunately, they didn’t have my size (can you detect my sarcasm?) so I moved on and did a quick search for the Marc Jacobs cardigan and Theory skirt (this is about the time I started to hear my VISA card start laughing maniacally). I had no luck locating either garment (and the laughing from my VISA was getting louder) so I put the Coach bag back on the shelf where I found it and promptly left the store (just kidding, it actually was my own Coach bag). It was nice to look at beautiful clothes and shoes though! Well, I think that I have done enough rambling in this post. Here’s hoping that this week’s challenge is also successful!